I’m constantly in the kitchen; creating new recipes, photographing new recipes and eating new recipes – this Easy Spaghetti Sauce is a result of one of those sessions. But sometimes, when it comes to writing about the recipes, I can’t think of anything to say. I could tell you that this spaghetti sauce doesn’t have any onion in it. Or how when one of my profs asked how The Beatles suddenly got so much fame, I was ready to rattle off about their years in Hamburg. I could tell you that I tore a muscle in my back and started going to massage therapy. And that I’ve come to the conclusion that massage therapy will always have a place in my heart. Or how scary/exciting/amazing/nice/panic inducing it is that people I know in the “real world”, people I went to high school with, people I work with, people I go to school with now, actually read my blog. Or how sometimes I think about how I could live off of chicken wings and spaghetti. 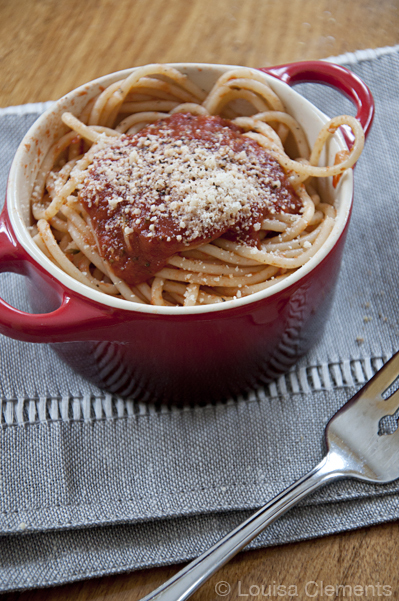 If you’re like me, and love a good spaghetti dinner this easy recipe is for you. There is hardly any chopping involved (just a couple of cloves of garlic). There aren’t 25 ingredients. It will be ready in less than 20 minutes. In a pan, heat olive oil over medium heat. Add garlic, and cook until fragrant, about 1-2 minutes. Next, add the herbs. Stirring and cooking for another minute. Add the crushed tomatoes and sugar. Bring to a boil, reduce heat, cover and simmer for 10 minutes. Lastly, stir in the balsamic vinegar and butter. Season with salt and pepper to taste. Spaghetti Sauce doesn’t get much easier than that. The flavours are rich and the balsamic vinegar gives it a little je-ne-sais-quois! I have a recipe that I have always used but I love trying other people's...looks delicious. I never thought to put balsamic in it either--sounds great! mmm homemade spaghetti is one of my favorite meals to use. i've seen a few different recipes adding vinegar to the sauce, but never balsamic. this looks amazing!